Those who live in the Midwest know just how tough the winters can be. There’s plenty of snow on the ground, the wind chill is often well below zero and the roads can be difficult to travel on. During that time of year, it’s important to stay bundled up and close to family. Still, some things in winter are relatively unaffected by the cold. In particular, families living in the country are used to seeing deer all around and on their property. Though deer are cute to some, they can be a real nuisance to shrubs and flowers. But one deer had an appetite for something just a little bit different. In a video that has recently swept the internet, one little deer came across an unusual sight. In the middle of the yard was a small, person-shaped mound of snow—better known to us as a snowman. At first, the cute little guy is a little unsure of what to do. He approaches cautiously, sniffing the air and trying to figure out what he’s seeing. Although there seems to be no easy food around for miles, the deer smells something that seems like it could be useful. That’s right: like many snowmen, this snowman’s nose is a carrot. It doesn’t take long for the deer to do what deer do best. 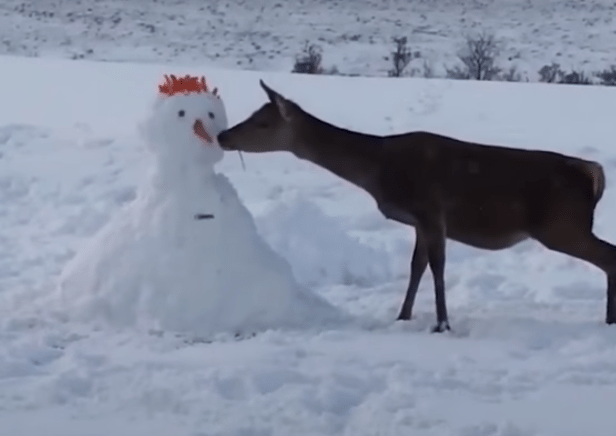 First, the sniffing becomes just a little too curious—and the nose falls right off the snowman’s face. With it safely on the ground, the deer does another little inspection… and then he takes a bite. Once it realizes the nose is ok, it eats the entire thing! 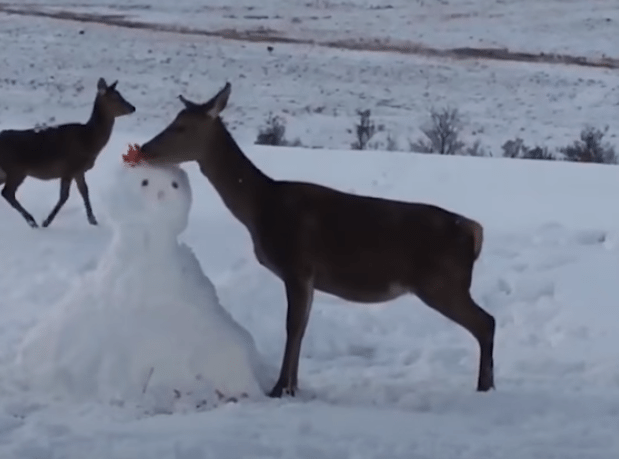 Fortunately for the deer, the snowman decorations were a little unorthodox. 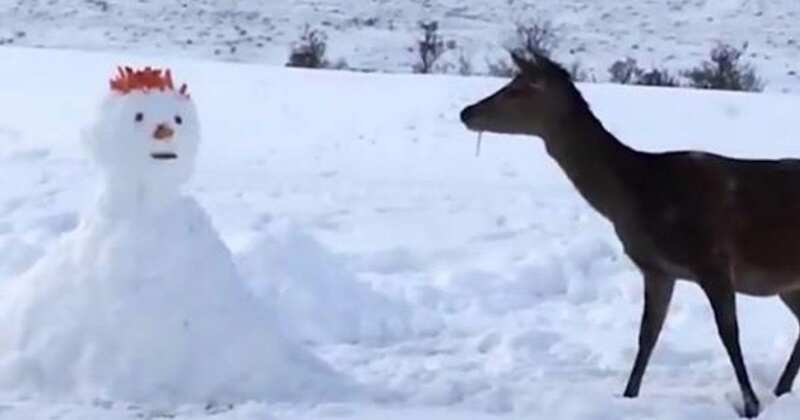 After a moment, the deer noticed something incredible. 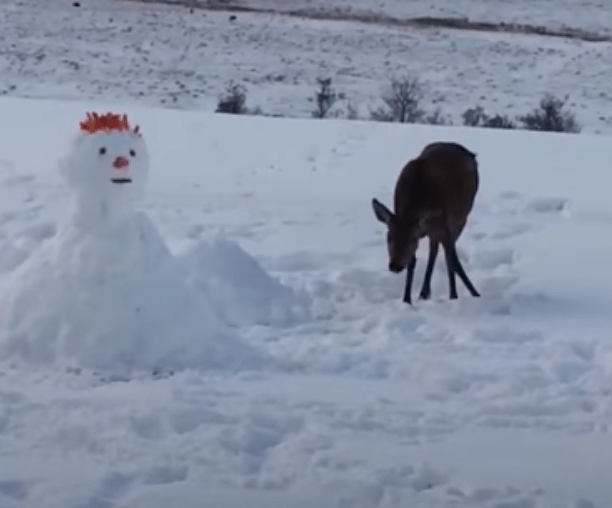 As it turns out, the snowman had an entire hairdo made out of carrots! Not long after the first came by, another deer happened upon the scene as well. Though the second one didn’t get any food, the first deer was still not done. Next, it knocked the snowman apart on the ground to check for any remaining—and hidden—carrots. Eventually, it was all over for that snowman. The video has been viewed more than a million times and is spreading holiday cheer no matter where it goes. After watching this, we can all be grateful that we have a warm place to sleep and food to eat while it’s so cold outside. For any deer watching, consider this a professional foraging tip!